Inflate some balloons, cue up the noisemakers, roll out the crepe paper streamers . . . EveryDollar is turning 2! In honor of EveryDollar’s second birthday, we’re throwing a party right here, and you’re invited. Here’s what we want our party guests to do: Take a few minutes to recognize how much your own life has changed for the better since you took control of your money with a budget. It makes us giddy to know you’re intentional about making a plan, sticking to it, and reaching your dreams! 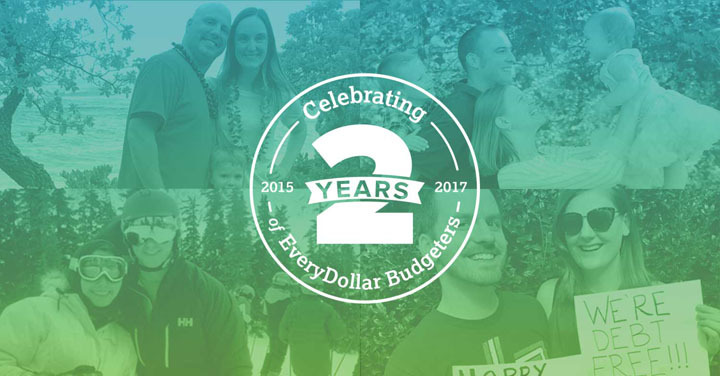 Then, check out some of our favorite money wins that EveryDollar budgeters have shared with us over the past two years. See if you recognize any of their success stories in your own life! If you’re not where you want to be yet, keep pushing forward until you reach your own awesome goals. You can do it! When we started using EveryDollar, we had about $10,000 in debt. If we wanted a car, we’d just take out a loan. If we were taking a vacation, we’d just put it on the credit card. We did all that because we didn’t think we had extra money to use. We paid off $10,000 in credit card debt in three months. We put several thousand dollars in our emergency fund, and we saved cash and paid for a vacation and a car! Now that we see we have extra, we can direct that money toward whatever we want to save for at that time. We never knew we’d be in this position when we started using EveryDollar. We now have permission to spend. If I want to go get my hair colored, my nails done, or buy a new dress, I can do that without feeling guilty because I know we have the money in our budget! Before we started using EveryDollar, we were making minimum payments on our debt. And because my husband didn’t understand my reasoning for using EveryDollar, it was kind of a struggle. But once we were on the same page, we started making extra payments. As a couple, we’ve been able to see that having that extra money allows us to do so much more. We can save for more of the things we want to do. We can make a last-minute decision to go on a trip. Doing the budget together and being on the same page made such a difference in our marriage. I feel like we are so much more unified on what our goals are and what our plan is. It’s such a freedom to know where we are and that we can move forward—together. Our marriage is better off now. When EveryDollar came out, we were really trying to finish up our emergency fund—and it was taking so much longer than we wanted. The visual nature of EveryDollar is what really helped us, because we could see the numbers better. If you take the time to actually look where your money is going and plan it out in advance, you're probably going to be able to do more than you're doing now. And you're going to be able to do it with less regrets. Before EveryDollar, we were paying just the minimum payment every month, and that’s all we ever paid. Our minimum payment was $670. Now, anything we have left over—any dollar, any penny even—goes toward paying off debt. This year, we’ve paid $1,400 a month toward our debt. Our short-term goal is to pay off our debt and then to take our kids to Disney World. But our long-term goal is send them through college debt-free. If they want to be doctors, we want them to be able to do that debt-free. We don’t want them to be limited because we bought too many cars. Don’t let another month go by without a budget! There’s no time like now to make a plan to transform your future! Sign up for EveryDollar today, or, if you’re already budgeting, start working on next month’s budget now!